Today I'm participating for the first time in The Well-Read Child's weekly meme, "What My Children Are Reading." I'm also the lucky host this week!! Welcome to all the regular participants and if you're newbie like me, join in the fun and write up a quick post about the books you're reading this week with your kids. Leave your link in the comments section of this post and I'll round them all up. Just to mix things up a little bit, I'm also participating in A Mommy's Adventures "stART" meme. StART = story + art. We created an art project to go along with one of the books that we've been reading. This week we checked out several monster themed books from the library. So far we've read The Monster at the End of This Book by Jon Stone, illustrated by Michael Smollin; Where the Wild Things Are by Maurice Sendak; Leonardo, the Terrible Monster by Mo Willems and I Need My Monster by Amanda Noll (will review this one here on 10/17/09). Both the kids really loved Go Away, Big Green Monster! by Ed Emberley. This monster book has become quite a popular classic. 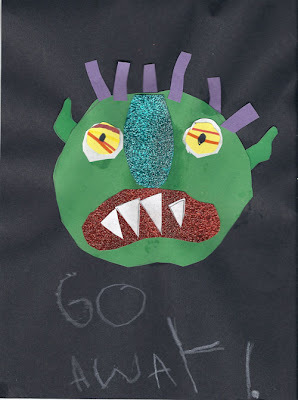 By turning the die cut pages kids "build" the face of a green monster and then make the green monster "Go Away!" piece by piece. Perfect for toddlers through early grade schoolers, the book helps teach colors and parts of the face (nose, eyes, etc.) For those children afraid of monsters, the book may help alleviate some of their fears because they can control the monster and make it disappear. The dazzling, sparkly cover on the newer editions really entices kids to pick this book up. Plus, it makes a great Halloween holiday read. Turns out, the die cut pages of Go Away, Big Green Monster! 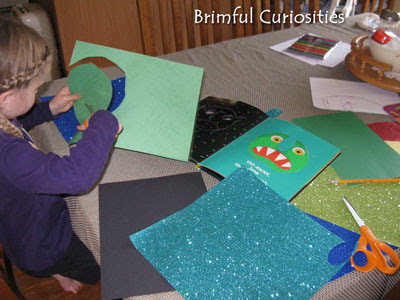 lend themselves perfectly to a fun, educational and colorful monster craft project. Trace the monster face parts using the die-cut book pages as your guide. Cut the pieces out with a scissors. Assemble the monster face using the cut pieces. (Discuss the names of the different facial parts and talk about the colors used.) Disassemble the monster piece by piece, just like in the story. Glue all parts to the black background. Draw the black eye centers in using a marker. Use the white crayon and write the words "GO AWAY!" on the bottom of the paper. 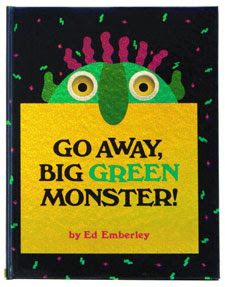 There's also a printable Go Away, Big Green Monster! pdf pattern at Kizclub.com to use in case you'd rather not trace your own monster face parts. If you are looking for a song to go along with the craft, check out the Go Away! Song at Super Simple Songs. Very cute. What are your kids reading this week? That is really clever to make the monster on a door hanger. I love it! We really like that book too! One of our favorite monster books that we discovered recently is When a Monster is Born by Sean Taylor. I have noticed that monster books/stuff are so popular right now! Thanks for sharing your craft! The monster is awesome! How fun! Love this topic! Our family has recently read The Legend of Spookley the Square Pumpkin for fall/Halloween. Thanks for letting us share it here!